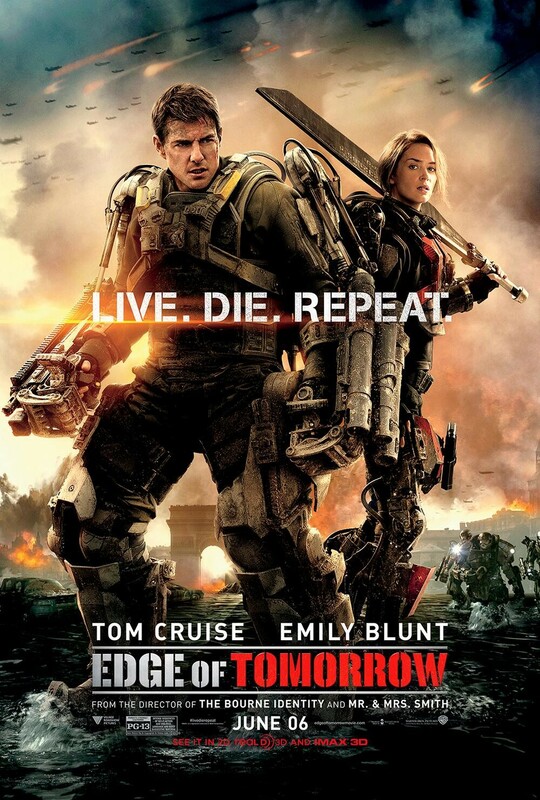 Edge of Tomorrow – Live. Die. Repeat! Screenplay by Christopher McQuarrie, Jez Butterworth, and John-Henry Butterworth. This is Tom Cruise vs Aliens #3. He first took on the aliens in “War of The Worlds” and then again in “Oblivion” last year. Edge of Tomorrow adds the premise from “Groundhog Day” to an alien invasion. What we get is a very good movie and one hell of a ride. Cage (Cruise) is pushing to have soldiers wear these robotic type suits of armor to help fight a war against invading aliens. Rita (Blunt) wore a similar suit in a recent battle and was able to fight off and defeat a group of aliens. The success of this battle has human kind thinking this is there chance to destroy the invading force. They decide to launch a full scale attack in Europe and Cage is ordered to join the attack. He is wearing a uniform that belongs to a senior officer but concedes he is not a soldier. Cage is forced to go to the front lines and when they arrive they are met head on with no mercy, they walk into a slaughter. The aliens were waiting for them because they use time against their enemies. When Cage kills one of the aliens that aliens blood enters his blood stream and he wakes up again at the beginning of the day. Now our story takes off as Cage tries to figure out how to use this advantage to help destroy the aliens. It is great to watch Cage go through his amazing transformation from a man who just wore a uniform to a man who had finally earned the uniform. The first person he encounters when he gets back after dying is a big drill sergeant who hands him his boots and yells at him. We see how everyone treats Cage differently as he becomes more and more courageous. He becomes a leader by living the same day over and over until he is ready for the final battle. I was enthralled with the performance by Emily Blunt who portrays a strong female role which Hollywood seldom allows. They love to have women be the damsel in distress and we see early on that she can’t be further from that stereotype if she tried. She is simply brilliant in this movie and her character drives this movie forward towards its conclusion at all times. When Cage is trying to romance her, she sees through it and demands to know how many times they had been there. She wants Cage to finish the mission because they are soldiers and that is what they are supposed to be doing. There are some great moments in this movie and I highly recommend it. Directors’ Previous Movies: The Bourne Identity, Jumper, Mr. and Mrs. Smith. If you liked this try: Oblivion, Independence Day, Groundhog Day.